It’s orange and black all over the city of San Francisco today, as the bay area is euphorically celebrating the World Series win of their beloved Giants baseball team. With a super successful season behind them, it’s no doubt that Giants season tickets have become a hotter item than ever, with premium prices many times more than what one would pay before they earned the championship ring. Now that more fans will be flocking towards the ballpark, what will it mean for the local area? Will real estate prices in the vicinity ride on the coat tails and world series boost? Is a condo by the ballpark now the new place to live? A quick scan of listings by ballpark on Redfin doesn’t give the appearance of any out of the ordinary listing activity. However, on the commercial front, things are already picking up. The activity at 410 Townsend reflects Silicon Valley’s broader tech recovery…That has fueled the ferment in SoMA, a hip start-up neighborhood that is home to Twitter Inc. and others. The area’s office vacancy rate peaked in last year’s fourth quarter at 30.5% and has since eased to 28.2%, while average asking rents per square foot have risen to $28.57 from $27.69 late last year, according to real-estate firm Cornish & Carey Commercial. 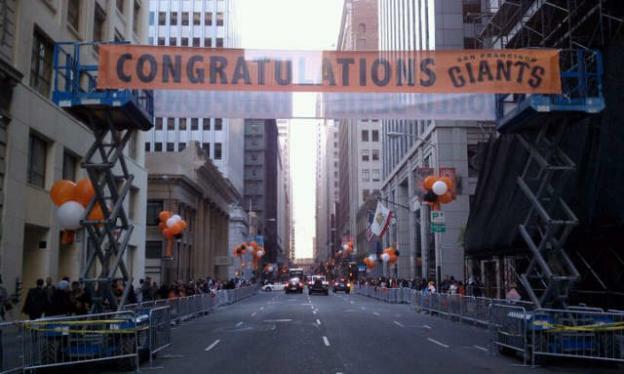 And this was way before the Giants were even in the playoffs. What’s more is that Salesforce just bought land there and will be planting their headquarters by the ballpark. Bloomberg News also made a mention of possible development plans of all those unattractive parking lots behind the ballpark. So it seems like on the non residential front, things are picking up. Will the World Series give this a further boost? Will residential real estate be next and give all those new condos a lift? For those who make their home by the ballpark, at least they have some bragging rights for the next year.